Hello! 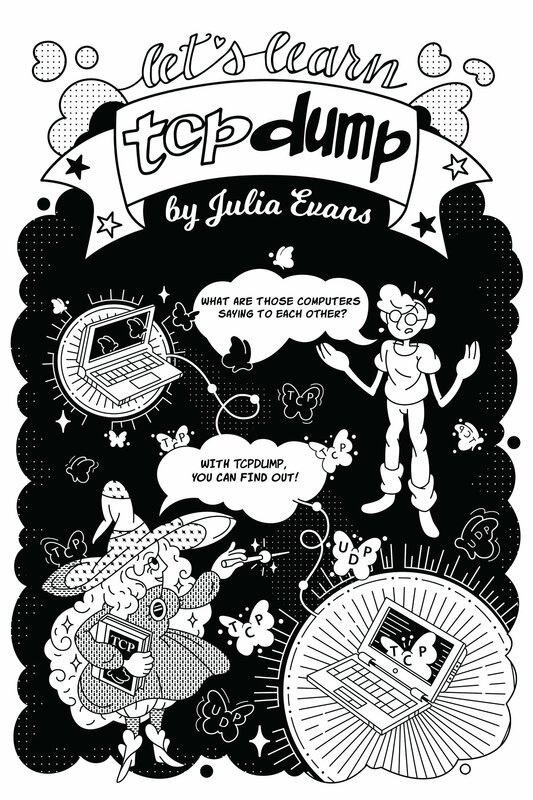 A couple weeks back, I wrote a zine called “let’s learn tcpdump!” and released the early access version for $10 as an experiment. Today, I’m releasing it for everyone! Read the zine online! Get the print version! The print version is pay-what-you-can. It includes a version with an adorable colour cover, if you want to print it in scintillating colour! 190 people bought it in all, for a total of $1970. Thank you, everyone! It feels really cool that people actually think the stuff I make is worth money, and it makes me feel motivated to make more zines like this. And it makes it easier for me to do things like pay illustrators to make awesome illustrations! 1 person bought an “enterprise license” ($100) so that they could print it out and give it out to a lot of people at their conference. Special thanks to my friend Maya who did the lettering for the title! you are the best. And to my awesome partner Kamal who always helps review my zines. And to the amazing illustrator Vladimir who made the cover! Paying artists is really cool.